Eighth-grade students create an anti-bullying toolkit to present to elementary students and educators. Until that winter, when an anti-bullying experiment that started with a small group of students turned into something much bigger, and became a part of my yearly eighth grade ELA curriculum. Break the System, my project to prevent bullying, began as a seven-day experiment with ten of my students. I set out with only a vague plan in mind: students would design a toolkit to prevent bullying, and maybe present it to elementary students. 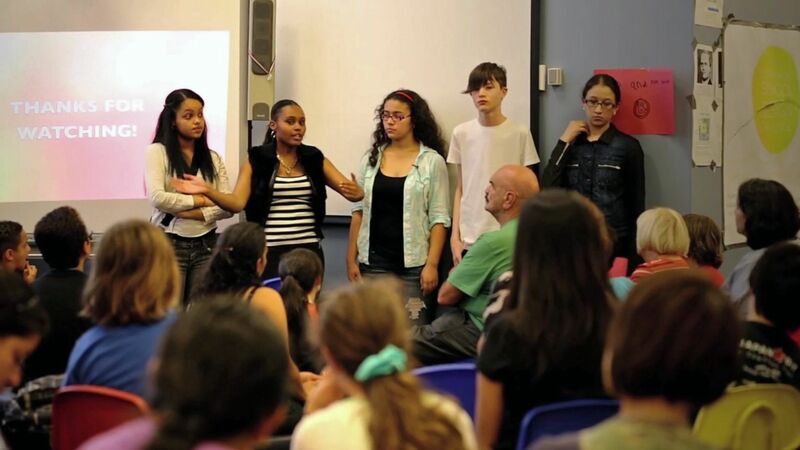 After only one week, that group of students had launched a movement -- complete with a short film, a toolkit of anti-bullying learning materials, and a series of moving presentations. Use systems thinking to develop complex written arguments. Here’s how I challenged my students to break the system of bullying. Students' experiences with bullying range from hearing the term but not understanding it, to feeling lasting damage from it, to believing that it's an important social structure. Every experience is valid -- as facilitators, we must respect that, and help students respect it. Developing a clear set of group expectations is vital to the process of discussing a sensitive topic like bullying. We co-created a set of group norms and signed a contract that we kept posted in the classroom throughout the project. Once the students felt safe opening up, I could see how trust was put into action. In one exercise, we watched the heart-wrenching documentary Bully, and then students took a few minutes to reflect silently in a free write. Sitting in a circle, I asked them to share their initial thoughts on the film, and I saw and heard amazing things. Students who had barely said more than two words to each other consoled one another. Students who were silent victims found the courage to speak. Students who had been aggressors showed deep remorse. And in the whole conversation, I didn't say more than a few words. That's the other part of trust. As educators, it can be hard to let go of control and let students drive their own learning. Try to step back and watch as they can guide their own learning -- it's incredible. As students take the reins, give them tools to look at the problem of bullying holistically. At Quest to Learn, we teach students to grapple with difficult problems through systems thinking. Using systems thinking tools like causal maps (webs of interrelated causes and effects with arrows illustrating their impact), students discovered leverage points to change the system of bullying. You can see examples (at 3:05 in the video above) of these causal maps which students created to examine the systemic nature of bullying. The first time I did this project, my students noticed a leverage point in elementary school empathy education. They decided that the younger we taught empathy, the less likely children were to bully later. In last year's class, students pinpointed various leverage points throughout the system of bullying, from school cultural factors to counseling services offered. The students saw all the places where people involved in the bullying system could take preventative measures (even some places that adults often miss! ), and they jumped at the opportunity to use these insights to initiate change. Of the many bullying prevention materials out there, most if not all of them are created by adults for children. When I tasked my students with creating a bullying toolkit for elementary students, they were excited not only about taking on a design challenge, but about being informed critics of the materials created by adult bullying experts who are more removed from the problem. What kinds of materials would appeal to this audience. Without even realizing it, students were considering the complex concepts of audience and authorship, tailoring their techniques to best fit their messages. They brainstormed a list of learning goals and products, and then narrowed it down to a manageable amount of materials to produce. Now that this project has become a part of my ELA curriculum, students develop toolkits in smaller groups with a more specific audience in mind, such as a certain grade, a group of parents, or educators. After students made decisions about what their toolkit needed, they divided up the work. This required students to approach challenges like adults do in a professional team setting. They considered even distribution of work, talents possessed by team members, and who might work best together. With a strict deadline, students worked efficiently and effectively. Most importantly, each student maintained ownership of certain parts of the toolkit. After intense periods of drafting, students came back together and evaluated each other's work. They gave verbal and written feedback, putting themselves in their audience's mindset to discover successes, flaws, and gaps. In no time, they were back at the work, scrambling to improve their creations. Check out the video above to see how these students worked together, and hear them reflect on their experiences in collaboration. What ultimately made all the hard work worthwhile was that it was real. Students knew their product would be presented to their audience. They knew that students, teachers, and parents would use the materials they created. At the end, I made sure they got to see it. We visited elementary schools around the neighborhood and presented to various classrooms, as well as principals, teachers and guidance counselors. The students presented with pride and confidence. They reflected knowledge they had developed during research, and passion they had developed through discussion. The best thing about this project is that it doesn't simply fade away once completed. The students made a real commitment to bullying prevention. For my first group of students, the project became a school club, which became a lunchtime peer support group. For my eighth graders who experienced this as a part of their curriculum, it became a way of handling future conflicts, an understanding of the process to make a change, and an increased awareness of an often hard-to-see problem. What steps have your school taken to help students break the system of bullying?